William James was an English lawyer, surveyor, land agent and pioneer promoter of rail transport. He was born the son of a solicitor, in Henley-in-Arden, Warwickshire in 1771. He trained as a solicitor but became a land agent for the Earl of Warwick. He later moved to London where he established one of the largest land agency businesses in the country. In 1804 he proposed the drainage of Lambeth Marsh which he surveyed on the instructions of the Prince of Wales and the Archbishop of Canterbury. His plans included a proposal for a new bridge over the Thames although not quite in the same position as the Waterloo Bridge that was eventually built. He tried to raise interest in draining Lambeth Marsh again in 1808 and this time he proposed a tunnel under the Thames from College Lane (roughly in the middle of Jubilee Gardens) to Scotland Yard. James purchased a colliery in South Staffordshire and was the first to open the West Bromwich coalfield. He became chairman of the West Bromwich Coalmasters’ Association, and was active in the campaign for a canal to Birmingham. James formed a company with Lord Whitworth and the Duchess of Dorset, but his attempts to find coal in Bexhill in Sussex ended in failure. However, his investments in collieries and the Stratford Canal made him a rich man and it was estimated that by 1815 he was worth £150,000. Although mainly concerned with canals, William James was aware of the developments being made with locomotives. In 1803 he had met Richard Trevithick and saw his Penydarren locomotive at Merthyr Tydfil. As a result of seeing the Penydarren locomotive, he decided to form the General Railroad Company. However, for many years he was too busy with his land agency and canal interests to develop his ideas on railways. After meeting George Stephenson at Killingworth Colliery in 1821, the two men agreed to build a railway between Liverpool and Hull. However, they were unable to carry out the project. William James also had plans for a railway between Liverpool and Manchester and in 1822 James produced his Preliminary Report on the Survey of Investigation for a Line of Engine Railroad from Liverpool to Manchester. James persuaded Joseph Sandars, a wealthy merchant, to support his plans. James also began plans to build other railways including: Canterbury & Whitstable, Shoreham & Portsmouth, Bishop’s Stortford & Cambridge and Stratford & Moreton. 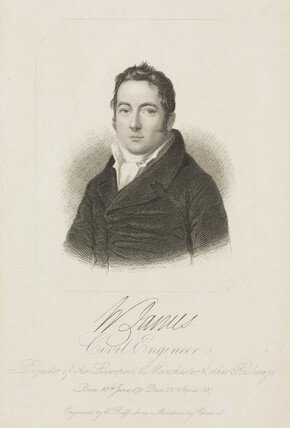 However, James over-stretched himself and in 1823 he was declared bankrupt and was imprisoned for debt. With James in prison, Joseph Sandars formed the Liverpool & Manchester Railway Company and asked George Stephenson to produce a new survey to decide the best route between Liverpool and Manchester. As a result of Stephenson’s report, Parliament agreed in 1826 to give permission for the Liverpool & Manchester Railway Company to build their railway. After his release from prison, James retired to Bodmin in Cornwall. He continued to make plans for other railways but none of them were built. William James died in Bodmin in 1837. One gets the impression James was a rather mercurial character with too many ideas and not enough patience to carry them through.